i-MBA > Getting Started with LinkedIn! 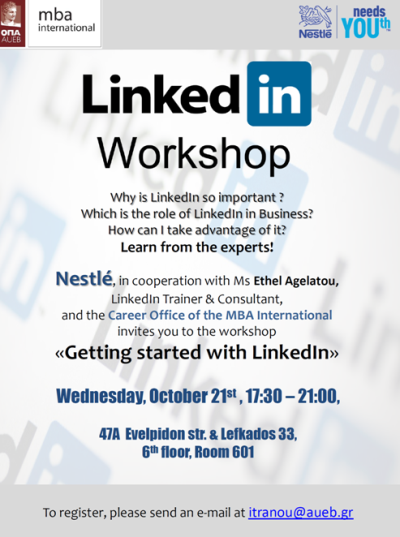 i-MBA Career Office, in collaboration with Nestlé Hellas S.A and Ms. Ethel Agelatou, organizes the workshop «Getting started with LinkedIn». “We are experiencing an era where social media stand as a powerful tool of promotion and branding to young people looking for career prospects. Thus, their social and digital participation is of utmost importance, especially since they are expected to retain a solid digital identity. This occurs mostly on LinkedIn which can bring out their professional profile, boost their approach towards future employers and shape their image as candidates, now and tomorrow” Ethel Agelatou. The workshop will take place on Wednesday, October 21st, 17:30 – 21:00 (Evelpidon Building, room 601) and is open to i-MBA students. To register, please send an e-mail at itranou@aueb.gr . Ethel Agelatou is a LinkedIn Trainer and Consultant, specialized in promoting and highlighting both personal and corporate branding of the platform’s users’ profile. She has trained more than 1000 people through hands-on workshops and auditorium lectures, and collaborated so far with 12 organizations & associations. As part of her devotion to LinkedIn, she has launched the Facebook page LinkedIn Greek Community; a large forum educating and assisting members on LinkedIn issues, trying to unite all Greek users. In parallel, she works as an Executive Search & Career Consultant, as well as an Editor of consulting journals (offline & online), covering topics on unemployment, personal branding, HR researches, entrepreneurship and Social Media (Kariera.gr, WeareSocialMedia.gr, BusinessCoachingLab.gr,HominumOpus.gr, HR Professional, Career Guide). During her career, she has both worked for recruitment agencies and HR departments, specializing in selection, recruitment, communication and corporate social responsibility. Nestlé is the world’s leading Nutrition, Health and Wellness Company. Its mission of “Good Food, Good Life” is to provide consumers with the best tasting, most nutritious choices in a wide range of food and beverage categories and eating occasions, from morning to night. The Company was founded in 1866 by Henri Nestlé in Vevey, Switzerland, where its headquarters are still located today. Nestlé employs around 339 000 people, its products are marketed in 197 countries worldwide and operates 442 factories around the world. Although Nestlé Hellas was formally established in 1914, its products have been marketed in Greece for over a century. Today Nestlé Hellas is one of the top leading companies in the food and beverage sector in Greece. Nestlé in Greece has 8 sites (3 factories among them) and approx. 1.000 permanent employees (September 2015). Nestlé employees are privileged to work as part of a global team with good working conditions and enjoy the opportunity for continuous development and training. In return, they are expected to work according to the company’s longstanding corporate business principles of dynamism, realism, pragmatism, hard work, honesty and trustworthiness.